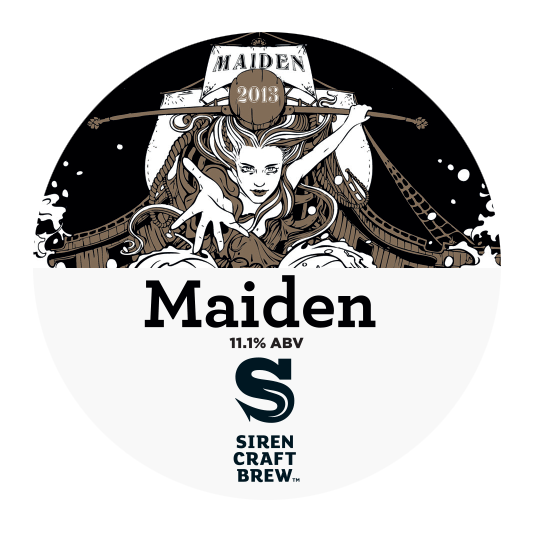 “The goal for Maiden is to celebrate our love of experimentation and the impact of wood and time on a beer. A big barley wine is brewed and then split into many different barrels with varied spirits and wines and differing types of wood to impart a wide palette of flavours. Then after a year has gone by we would then bring them back together and craft a blend that would bring complexity and balance. The base beer was the first batch brewed in 2014, which was a solid american style hoppy barley wine. This was partly used in the 2013 release and the rest was used to top up the barrels from our first year release. New barrels including red wine, sauternes, banyuls and whisky were then also added to the mix. This year, along with our own team of brewers and back of house team, we asked for help in putting together the blend from Andrew at Le Grappin & the team at East London Liquor Company. Andrew, who has helped us get hold of many a wine barrel creates his own range of wines from previously unloved parcels of land in the C’ote D’Or. With a vision of being true to the vines and creating the wine he wants rather than working to dogma, we felt he would be able to add a different angle to our blending process. East London Liquor Company are a brand new distillery set in the heartland of London’s old spirit heritage. With a beautiful still on display and fabulous bar to enjoy their creations, ELLC have already created some amazing gins, vodka and rum and also have a whisky aging in the cellar. They kindly agreed to come down and add their own experience at creating flavour profiles to our blending team. The day started off with a discussion about the beer and the vision for the project, making it clear to everyone that we were looking for the best possible beer from the day, not to make sure we make the most out of all the barrels we had. Then both of our guests were invited to talk about their process for creating and blending when working in their own field. A sample of each of the barrels were laid out in front of us, including the base beer for what will become Maiden 2015, and we all tasted each and every barrel made notes, discussed and tasted some more. A few of the barrels had picked up some Brett, and some of them in a very nice way, however, Maiden is not about brettanomyces so these barrels were kept aside for future projects. After a full afternoon of tasting and discussion, the time for talking was over, we each put forward our individual favourite blend for a vote. The decision was not easy, there were many different approaches taken with each resulting in different highlights and accents, but a majority vote won through.